Post Malone is lucky to be alive. That’s pretty much a fact. You might be thinking, ‘aren’t we all?’, and I guess that’s true. Everyday we cheat death – whether it’s by walking across a busy street or wolfing down a large hot dog. We’re always just one bad decision away from being pummelled into the pavement by a bus or choking to death in a fast-food chain. Yikes. But what I mean is, Post Malone is very lucky to be alive. Just weeks ago, a plane he was on was forced to crash land with no tyres after they blew out on takeoff. Luckily, the landing was pretty straightforward, but still. Flying around thousands of feet above the ground, trying to burn up as much fuel as possible to ensure you’re not all engulfed in a fiery inferno of death when you hit the ground isn’t exactly my cup of tea. Evading a possible death like that once is scary enough, but just weeks later, he was involved in a serious car crash. Yet again he was able to stroll away unharmed. How? I don’t know? But why is probably a more interesting way for this article to go. Shortly after his crash, Malone acknowledged the accident, tweeting, ‘god must hate me lol’, but his fans and conspiracy theorists have other ideas. In the aftermath of his death scares, Twitter has been electric with theories – namely, the Illuminati, or even a hitman are trying to take out Mr Malone. My sister already thinks the Illuminati are trying to kill Post Malone. Months before the plane scare, the car crash, and the home invasion, Post was hanging out with none other than Zak Bagans of Ghost Adventures. 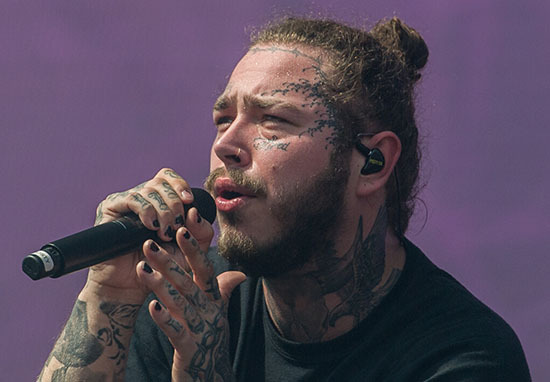 Post reportedly had a few beers and was getting a bit freaked out – namely because they were in a room with an object known as ‘the world’s most haunted’ – which was the main source of inspiration for the film The Possession. The object is called the dybbuk box. Dybbuk being Yiddish for ‘malicious spirit’. There’s a long story behind the box but long story short, it’s believed the box contains a restless spirit. It’s been bought and sold many times – its owners all reporting terrifying occurrences which only began happening after obtaining the box. Things such as enduring terrifying nightmares for weeks on end, coughing up blood, getting hives from head to toe, and noticing a smell of cat urine have all been documented. After being passed about for years, the box was eventually donated to Zak’s museum – which is when Post came into contact with it. Zak took the protective case off the box and claims he felt possessed to touch it. Post was terrified but for some reason he touched Zak, as Zak was touching the haunted box. Apparently, because Post was, for a moment, somewhat connected to the box, it’s enough to warrant a curse of sorts. Zak thoroughly believes this is the reason for Malone’s recent string of near-death experiences. What do you think?